I am so excited to be here today at the amazing Rhinestone Beagle!! I'm Christie, from Describe Happy and I am here with my lovely and rather furry assistants Sammy (the smaller white golden puppy) and Katie (the four year old blond golden) to help you get you Howl-oween spook on!!! Sammy, are you ready to get crafting? Hey, what's that on your head? Is that an origami bat? Wicked... let's show the nice folks how to make one in a quick dozen steps? Start with a square piece of paper (Katie is handing me pre-cut origami paper). Printer paper also has about the right thickness, but you could also use wrapping, news, or magazine paper. We used orange in this demo, but also found that black, brown, blue, and even purple bats were awesome. Step one. Turn your square pretty side down. Step two. 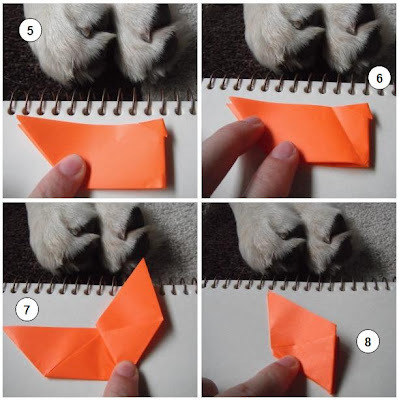 Fold the paper diagonally pulling the bottom corner up to the top corner (oogle at the puppy chewing on corner of the sketch pad). 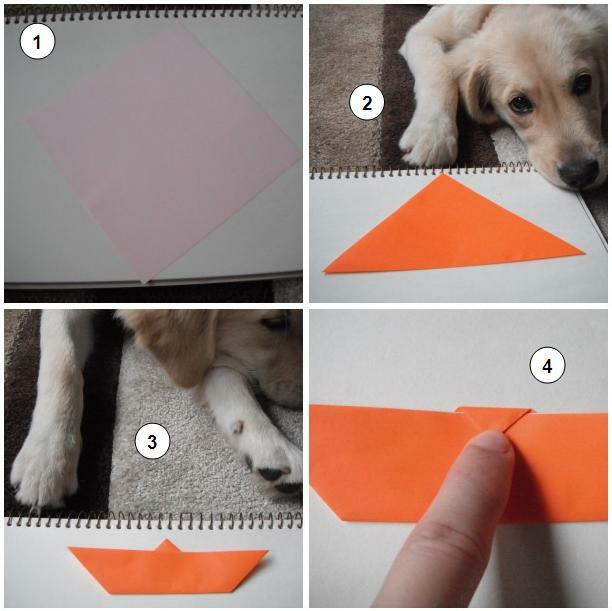 Next, fold the left corner to the right corner, leaving you with a triangle that is all orange. Step three. Bring the bottom of the triangle up nearly to the top... leaving just a tiny bit of the top of the triangle showing and make a nice fold. See, you can do this!! Origami totally rocks! Step four. Now fold that tiny bit of the triangle top down. This becomes the bat head!! Step five. Fold the bat in half now with the head facing outwards. Step six. 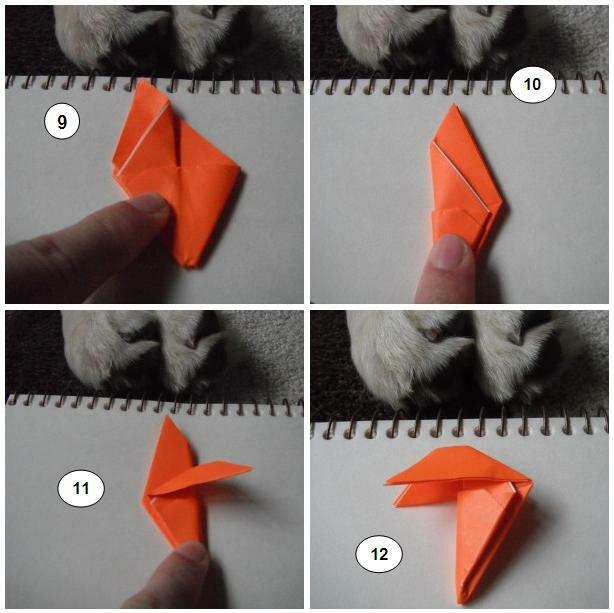 Here I wanted to show you the fold line I am making in step seven. You can see the wing gets folded over to the right with the bottom forming a point. Step eight. Now you are going to make the same fold in steps six and seven to the other side leaving you with the diamond shown here in step eight. Step nine. You will notice that your diamond has a flap on the right (or left) that you are going to pull to the left, almost opening it like a book. Step ten. You guessed it ... in this step you are doing the same thing to the other side. Now it looks like half a diamond, right? Step eleven. You are almost there. Don't even think about giving up... and seriously don't worry about how pretty/perfect your folds are this point because the last step is to unfold most of it to reveal the bat... hang in there. In these last two steps you are going to bring a top flap down and to the right (or left) and make another crease. Step twelve. Here, I flipped my paper over and am just bringing down the other top flap. 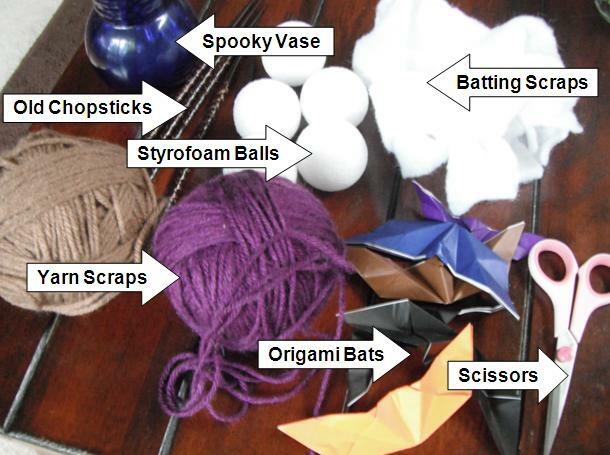 ...and here is Katie's bat all unfolded and ready to decorate with (ignore the tiny bit of slobber -- being an assistant is a messy job after all). You can hang them from curtain rods, use them to top cupcakes, stick them in spider webs, or make a creepy bouquet with them and a few other supplies. Take the batting scraps (for you quilters) or cotton balls or tissue paper and wrap around the styrofoam ball... then begin to wrap a bit of yarn around. I left holes for the batting to show through and then pulled on it to give it more texture. Use single colors, mix and match, bottom line is have some fun making up what you think a bat nest might look like. Then it's as easy as putting a toothpick in the bat -- I did make a small cut at the bottom of the bat to make it easier -- and then push the bat on toothpick into a bat's nest! Insert a chopstick into the other side or bottom of the nest and voila!! A few more of these and you have a whole batty bouquet of spooky goodness to share or display! 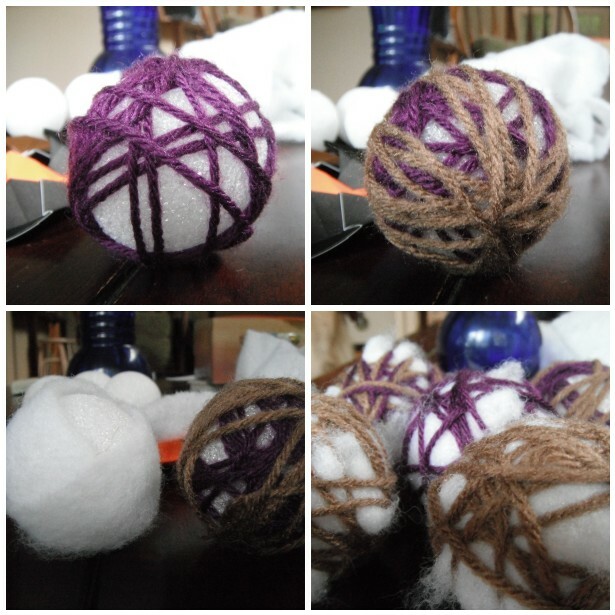 Last touch was to add a bit of cotton and yarn to the vase to carry the theme. Wowie..I seem to have really tuckered out the puppy. Or she isn't all that impressed. Let's just say she is pooped from all the creepy crafting, shall we? Frightening, isn't it? Hope you had howling good time and won't think twice about digging into origami again. From Katie, Sammy and I... have an extra spook-tacular Howl-oween!!! 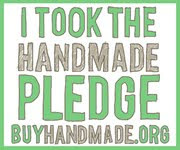 Go check out Christie's blog Describe Happy for lots of creative puppy happiness.